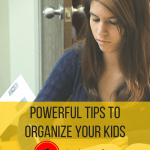 When you have a kid who has ADHD or is just plain disorganized, basic school stuff can be a real challenge. These are some tips to make it much easier for BOTH of you. To me, the advantage of being an older Mom is that this isn’t my first rodeo. (I repost this info every year at back to school time, so things have changed a bit over the years.) This month, my youngest is now a Senior in High School, so this will be our last trip through the public school system. Hard to believe, but I’ve had one or two boys in school continuously for 30 straight years – Wow! Son #1 sailed through with flying colors, but son #2 had that ADHD business happening and it was pretty rough going. Since son #3 is practically a carbon copy of #2, I have a chance to do things a little differently this time around and hopefully get through with a little less stress (on both of us), and I hope a better outcome. Our middle son literally had his cap and gown held hostage on his graduation day because he still had a couple of missing assignments to make up. I’m hoping not to repeat that situation again! One thing I’m doing differently is doing my homework – literally. 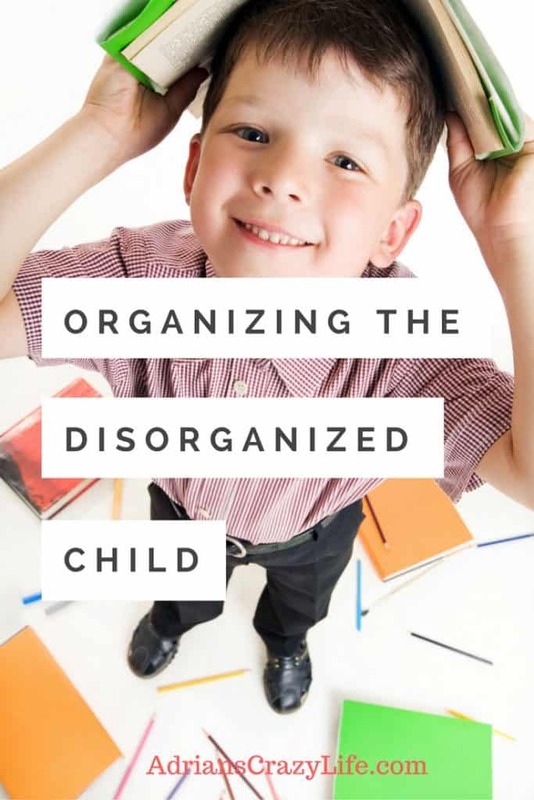 A friend recommended a great book called “Organizing the Disorganized Child” by Martin L. Kutscher & Marcella Moran. I’m not only reading it, I’m blogging about it, partly to help me cement the lessons into my life, and partly to help you with your kids too. Disclaimer: This is an affiliate link and I will receive a small commission if you click the image. It’s one of the ways I support my site. The opening chapter really rang a bell with me. They start out by talking about brain development. Turns out that part of the problem is that these kids may not have developed mature enough brains to have the thought processes required for proper organization. That made a big change in my attitude right there. You can get mad at a kid you think is lazy or isn’t trying hard enough, but not at a kid who simply isn’t capable of what you’re asking. « Does a Clean House Equal Money in the Bank? I like your idea of labeling the two different spaces on the Trapper Keeper. That’s an easy way to keep things a little more organized. Thanks for linking up at the Bloggers Brags party, I pinned your post to our group Pinterest Board. Thanks for the boost. 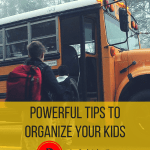 Keeping kids organized is half the battle. Mine seems to be “allergic” to any kind of organization. I need to buy my mom this book. I’m in my 30s and she still tries to organize me! But I did learn a few things about myself in this post. Good luck with your son this year! I know – I have kids in their 20’s and 30’s and you still feel responsible for teaching them stuff. But yes, I thought it was a great book and I got a lot of insights out of it. I say get it. Thanks for stopping by! Really important tips to keep in mind for parents in this situation. Much appreciated. Thank you, I’m so glad you’ve enjoyed my tips. This book sounds wonderful! I will have to share with our parents that come to our center. Many of our students struggle with ADHD or attention and focus issues. It’s really important for them to have the structured schedule like you talk about above. I love how it talks about the brain too. All great information for parents to help their kids, especially as they go back to school. Love it! There’s a lot of great books out there and I’ve found them to be very helpful in dealing with my own ADHD boys. They can be quite a challenge. I’m glad this helps them. GREAT ideas! I love the idea of the ZAP party and may try to implement something like this at my school. So glad to find you through SITS Sharefest. I would be honored if you would link-up to the Saturday Soiree Blog Party at http://faithalongtheway.com. Hope to connect with you there. I am your newest follower! These are excellent suggestions. I am going to pin and share this post on our blog! Sounds like an interesting book. I’ve been meaning to do something similar this year since we sometimes run into issues with our son – he has this random spurs of “not having any homework” and then I get told he missed quite a few assignments. Thanks for sharing your advice!